When you first created an account, Endpoint Protection organized your managed devices into a single console. A console is a collection of one or more endpoints running SecureAnywhere or other Webroot products. If you have a large network with hundreds of endpoints, you might want to create multiple consoles for simplified views of device groups. For example, you can create separate consoles for endpoints in remote offices or endpoints in separate departments. Note: Adding a console requires that you obtain a new keycode from Webroot. Keep in mind that our Endpoint Protection billing system is based on the number of seats you have, not on the number of keycodes. You do not need to purchase a new keycode, unless you have exceeded your maximum allowance of endpoint seats. Contact your Webroot sales representative for more information. This section describes how to add a console, rename a console, and switch between consoles. Before you create a console, you must first obtain a new keycode and deploy SecureAnywhere to the endpoints with that keycode. When you create the console, it will automatically discover the endpoints that use the new keycode. If you need to migrate existing endpoints from one console to another, you must contact Webroot Business Support for assistance. Go to the SecureAnywhere website: https://my.webrootanywhere.com. Instead of logging in to your account, click Sign up now. In the first field, enter the new keycode. In the remaining fields, specify your existing account information for the remaining fields as described in the following table.address, password, security code, and security question and answer. Enter the email address for the administrator who will manage Endpoint Protection. The account activation confirmation is sent to this email address, which is also the username for logging in to the Management Portal. Enter a minimum of nine characters. Your password must contain at least six alphabetic characters and three numeric characters. Your password can be longer than the required nine characters. It can include special characters, except for the angle brackets: < >. Your password is case sensitive. As you type, the Strength meter shows how secure your password is. For optimum security, it’s a good idea to make your password as strong as possible. Enter a word or number, which will be used for an extra security step after you enter the password during login. Choose a code that is easy to remember, using a minimum of six characters. Every time you log in, the Management Portal prompts you to enter two random characters of this code. For example, if your code is 123456 and the system prompts you for the fourth and sixth character, you would enter 4 and 6. Your Personal Security Code is case sensitive. Select a question from the drop-down list. If you forget details of your login later, you will need to provide the answer to this question to retrieve the information. Security Answer Type an answer to your security question. The Security Answer is case-sensitive. 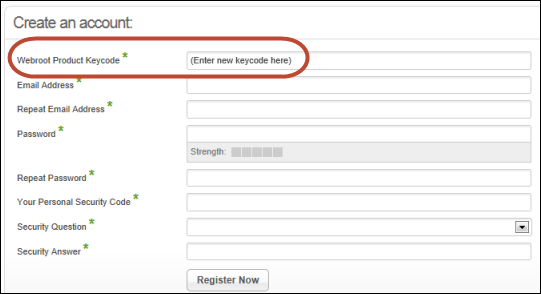 As shown in the following example, Webroot recognizes your account information and prompts you to either create a new console for the keycode or add the keycode to an existing console. Click Select in the left panel to add a new console. The SecureAnywhere website creates the console and prompts you to log in. Log in with your account information, then choose the new "Unnamed Console." You can rename it as described in the following section. Your new console shows any endpoints that use the keycode you entered. Click Rename located below your login name in the upper right. Enter the new name (using numbers and spaces, but not special characters), then click Save. Click Change Console (located below your login name in the upper right). Select the console name from the table.